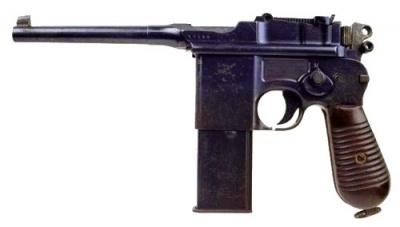 The '''Mauser C96''' (commonly called the "Broomhandle" or "Broomhandle Mauser" due to its distinctive grip, was a German semi-automatic pistol manufactured from 1896 to circa 1937. 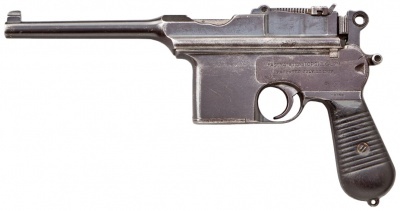 The C96 Mauser was one of the first semi-automatic pistols to see widespread use and was copied in Spain and China. There was a .45 ACP version produced from 1929 through 1936, at the arsenal at Shanxi (also spelled Shansi and Shansei) in China: this variant was nicknamed the "box cannon," with various explanations for this being either the weapon's weight (2 pounds heavier than the 9mm or 7.63mm variants), its boxy appearance, and / or its ability to be stowed inside its own stock. 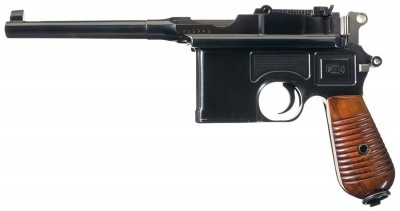 The '''Mauser C96''' (commonly called the "Broomhandle" or "Broomhandle Mauser" due to its distinctive grip), was a German semi-automatic pistol, developed in 1895, and manufactured from 1896 to circa 1937. 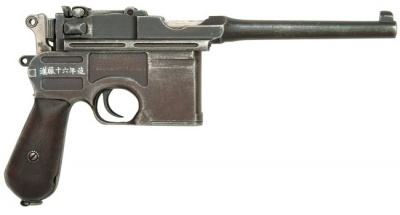 The C96 Mauser was one of the first semi-automatic pistols to see widespread use and was copied in Spain and China. There was a .45 ACP version produced from 1929 through 1936, at the arsenal at Shanxi (also spelled Shansi and Shansei) in China: this variant was nicknamed the "box cannon," with various explanations for this being either the weapon's weight (2 pounds heavier than the 9mm or 7.63mm variants), its boxy appearance, and / or its ability to be stowed inside its own stock. One particular point of interest with the C96 is that the weapon is entirely held together through the fit of the parts: there are no pins and only one screw in the entire gun, the one that holds the grip panels on. One unfortunate aspect of this construction is that the barrel and the rest of the upper are a single forging: many vintage 7.63x25mm Mausers have "shot out" barrels that cannot easily be replaced, and so have been re-bored for 9mm rounds. It should also be noted that with the stock attached, it is more or less necessary to use an irregular hold (thumb of the strong hand not wrapped around the grip) to avoid the hammer slamming into the user's thumb. 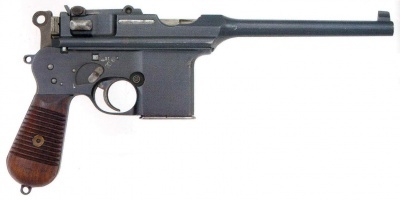 * The original '''C96 Military Model''' had full-sized long grips, a fixed ten-shot magazine, a 5.5-inch [140mm] barrel, adjustable tangent iron sights calibrated to 1000 meters, and was chambered in 7.63x25mm Mauser (aka .30 Mauser). It was made from 1896-1921. Collectors give four variants of this model: the earliest have a "cone hammer" or "large ring hammer" and a short-travel safety (with a difference between the two positions of only 0.18in) where down is the safe position, while the later "Pre-War Commercial" and "Persian Contract" models have a safety lever designed for the 1902 American trials, with longer travel and up as the safe position: this later safety can be recognised by having a hole through the knob at the end of the lever. Later versions with the "new safety" (wartime commercial, Prussian contract and postwar Bolo) do not have a hole either, while the M30 and M712, with the "universal safety," do. 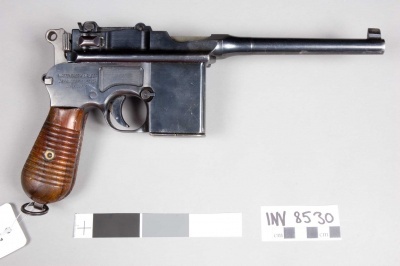 * The original '''C96 Military Model''' had full-sized long grips, a fixed ten-shot magazine (a version with the 20-round magazine also existed, but because of the inconvenience of reloading, this variant did not become popular), a 5.5-inch [140mm] barrel, adjustable tangent iron sights calibrated to 1000 meters, and was chambered in 7.63x25mm Mauser (aka .30 Mauser). It was made from 1896-1921. Collectors give four variants of this model: the earliest have a "cone hammer" or "large ring hammer" and a short-travel safety (with a difference between the two positions of only 0.18in) where down is the safe position, while the later "Pre-War Commercial" and "Persian Contract" models have a safety lever designed for the 1902 American trials, with longer travel and up as the safe position: this later safety can be recognised by having a hole through the knob at the end of the lever. Later versions with the "new safety" (wartime commercial, Prussian contract and postwar Bolo) do not have a hole either, while the M30 and M712, with the "universal safety," do. * The small-framed '''M1896 Compact Model''' (made from 1896-1899) had full-sized long grips, a short 4.75-inch [120mm] barrel, and a 6-shot fixed magazine. Collectors call them "Pre-War Bolos". * The rare '''M1912 Export Model''' was designed for the South American market and was chambered in 9x25mm Mauser Export. * The '''M1916 ''"Red 9"'' ''' was a 9x19mm model produced to fill a contract for the Prussian army during the First World War. As it was externally identical to the concurrently produced 7.63mm version, its caliber was burned on each side of the grip and prominently marked in red or black paint. Some collectors refer to the 'Red 9' version as the ''1916 Prussian Contract''. * The '''M1917 Trench Carbine''' was a rare 9.5-inch barrel fixed-stock carbine variant of the M1916 modified to use a massive 40-round detachable box magazine, intended to compete with the ''Trommelmagazin''-equipped Luger as a trench raiding weapon. It was rejected on cost grounds with prototype serial numbers not exceeding double digits, and most of the prototypes were destroyed due to the terms of the Treaty of Versailles, with just four examples surviving to the present day. * The '''M1917 Trench Carbine''' was a rare 9.5-inch barrel fixed-stock carbine variant of the 9x19mm M1916 modified to use a massive 40-round detachable box magazine (10 and 20-round magazines were also developed; the 10-shot being incompatible with later M1917s, because of different receivers), intended to compete with the ''Trommelmagazin''-equipped Luger as a trench raiding weapon. It was rejected on cost grounds with prototype serial numbers not exceeding double digits, and most of the prototypes were destroyed due to the terms of the Treaty of Versailles, with just four examples surviving to the present day. * The '''M1920 "Rework" Models''' were Weimar Republic government and military issue Pre-War Mausers modified to meet the restrictions of the Treaty of Versailles (1919). They had cut-down 3.9-inch [99mm] barrels and reworked and simplified fixed sights. Pistols chambered in non-standard chamberings like 9x19mm Parabellum were converted to chamber standard 7.63x25mm Mauser rounds. 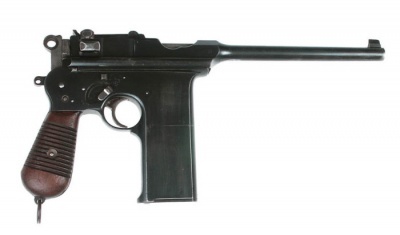 Converted models were stamped "M1920" to show they were compliant; this practice continued on government-issue weapons even after the ban was no longer in effect. * The '''M1921 "Bolo"''' model had small grips, a 10-round magazine, and a short 3.9-inch [99mm] barrel. It was first produced as a variant model for domestic sales from 1920 to 1921, going into full production from 1921 to 1930.The name "Bolo" is short for Bolshevik. Reportedly the Russian Communists or Bolsheviks favored the Broomhandle and in particular the Model 1921. The model was also popular with Poles, Lithuanians, German Freikorps, and White Russians. Among collectors the Bolo model is one of the most popular. 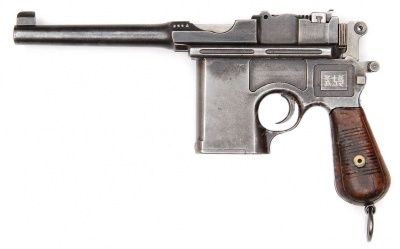 The Mauser C96 (commonly called the "Broomhandle" or "Broomhandle Mauser" due to its distinctive grip), was a German semi-automatic pistol, developed in 1895, and manufactured from 1896 to circa 1937. 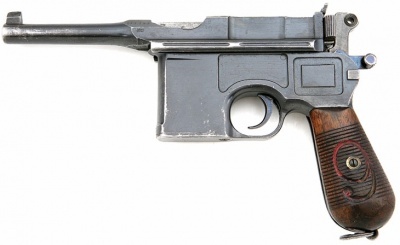 The C96 Mauser was one of the first semi-automatic pistols to see widespread use and was copied in Spain and China. There was a .45 ACP version produced from 1929 through 1936, at the arsenal at Shanxi (also spelled Shansi and Shansei) in China: this variant was nicknamed the "box cannon," with various explanations for this being either the weapon's weight (2 pounds heavier than the 9mm or 7.63mm variants), its boxy appearance, and / or its ability to be stowed inside its own stock. 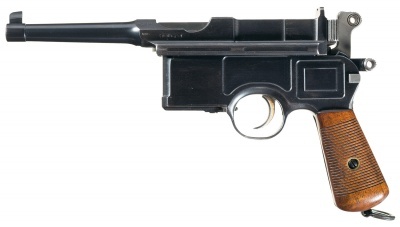 There are several major variants, though continual product improvement at the Mauser factory led to dozens or hundreds of individual variations arising over four decades of manufacture. 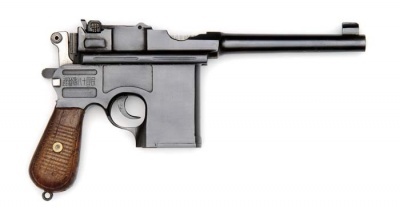 The original C96 Military Model had full-sized long grips, a fixed ten-shot magazine (a version with the 20-round magazine also existed, but because of the inconvenience of reloading, this variant did not become popular), a 5.5-inch [140mm] barrel, adjustable tangent iron sights calibrated to 1000 meters, and was chambered in 7.63x25mm Mauser (aka .30 Mauser). It was made from 1896-1921. Collectors give four variants of this model: the earliest have a "cone hammer" or "large ring hammer" and a short-travel safety (with a difference between the two positions of only 0.18in) where down is the safe position, while the later "Pre-War Commercial" and "Persian Contract" models have a safety lever designed for the 1902 American trials, with longer travel and up as the safe position: this later safety can be recognised by having a hole through the knob at the end of the lever. Later versions with the "new safety" (wartime commercial, Prussian contract and postwar Bolo) do not have a hole either, while the M30 and M712, with the "universal safety," do. The small-framed M1896 Compact Model (made from 1896-1899) had full-sized long grips, a short 4.75-inch [120mm] barrel, and a 6-shot fixed magazine. Collectors call them "Pre-War Bolos". The rare M1912 Export Model was designed for the South American market and was chambered in 9x25mm Mauser Export. The M1916 "Red 9" was a 9x19mm model produced to fill a contract for the Prussian army during the First World War. As it was externally identical to the concurrently produced 7.63mm version, its caliber was burned on each side of the grip and prominently marked in red or black paint. Some collectors refer to the 'Red 9' version as the 1916 Prussian Contract. The M1917 Trench Carbine was a rare 9.5-inch barrel fixed-stock carbine variant of the 9x19mm M1916 modified to use a massive 40-round detachable box magazine (10 and 20-round magazines were also developed; the 10-shot being incompatible with later M1917s, because of different receivers), intended to compete with the Trommelmagazin-equipped Luger as a trench raiding weapon. It was rejected on cost grounds with prototype serial numbers not exceeding double digits, and most of the prototypes were destroyed due to the terms of the Treaty of Versailles, with just four examples surviving to the present day. 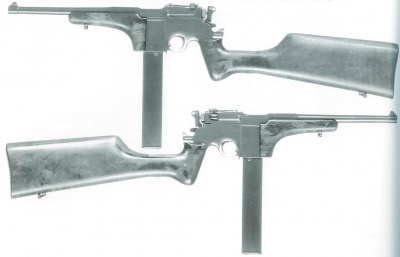 The M1920 "Rework" Models were Weimar Republic government and military issue Pre-War Mausers modified to meet the restrictions of the Treaty of Versailles (1919). They had cut-down 3.9-inch [99mm] barrels and reworked and simplified fixed sights. Pistols chambered in non-standard chamberings like 9x19mm Parabellum were converted to chamber standard 7.63x25mm Mauser rounds. Converted models were stamped "M1920" to show they were compliant; this practice continued on government-issue weapons even after the ban was no longer in effect. The M1921 "Bolo" model had small grips, a 10-round magazine, and a short 3.9-inch [99mm] barrel. It was first produced as a variant model for domestic sales from 1920 to 1921, going into full production from 1921 to 1930.The name "Bolo" is short for Bolshevik. Reportedly the Russian Communists or Bolsheviks favored the Broomhandle and in particular the Model 1921. The model was also popular with Poles, Lithuanians, German Freikorps, and White Russians. Among collectors the Bolo model is one of the most popular. The simplified M1930 Model had a 5.2-inch [132mm] (1930) or 5.5-inch [140mm] (later) long barrel, a solid one-piece grip frame and large wooden grips, and a lack of decorative milling on the frame and hammer. Collectors call this model the "M30". It was also erroneously called the "M711" by military surplus dealers to distinguish it from the similar selective-fire and magazine-fed M712. 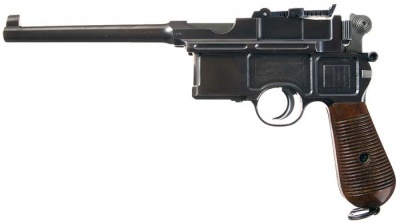 The "Schnellfeuer" ("fast fire") was introduced in the early 1930s in response to the select-fire C96 copies produced in Spain in the late 1920s. It used ten- or twenty-round detachable magazines and a select-fire mechanism designed by Joseph Nickl (1930-1932), later improved by Karl Westinger (1932-1936), the latter the most commonly seen. With a rate of fire of 900-1,000 rpm, the ten-round magazine lasts around two-thirds of a second: recoil and muzzle climb is ferocious. Despite this, the model was highly successful: production began in 1932 and ended in 1936 after a run of around 98,000 guns. The Schnellfeuer is popularly known as the "M712", its Wehrmacht designation during World War 2, and some collectors also refer to it as the "M1932." Semi-auto only variants were imported into the US following the introduction of the National Firearms Act, since the $200 "machine gun" transfer tax was originally significantly higher than the cost of the Schnellfeuer itself. The Astra 900 was a Spanish copy of the C96 produced by Unceta & Cia. 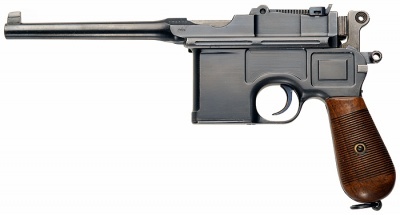 It retained the overall shape and locking system of the C96, but used a trigger mechanism of original design. The Astra 903 was Unceta's equivalent of the M1932 Schnellfeuer, though unlike Beistegui's later versions the 903 was not compatible with Schnellfeuer magazines. The Astra Model F was a version of the Astra 903 chambered in 9mm Largo. Beistegui Hermanos made copies of the Astra 900 line. 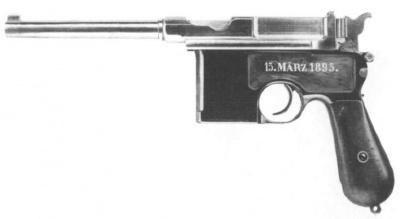 Later production examples were, unlike the Astra line, compatible with Mauser-produced Schnellfeuer magazines. 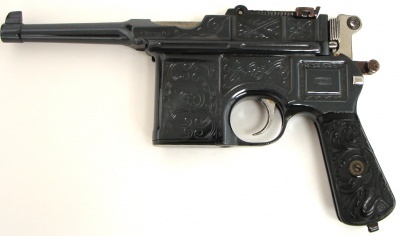 The Type 17 was a .45 ACP version produced in Shanxi, China under the orders of ruling warlord Yan Xishan in order to maintain ammunition compatibility with the Thompson M1921 clones his Taiyuan factory already produced. C96 copies of varying quality were also produced by Chinese arsenals at Hanyang, Taku, and several other locations. The Hanyang C96 was another Chinese copy of the Mauser C96, produced by Hanyang Munitions Works from 1923 to the 1930's. Around 13,000 guns were manufactured. PASAM (Pistolas Automaticas e Semi-Automaticas Mauser, "Mauser Automatic and Semi-Automatic Pistols") pistols are 7.63x25mm Mauser M712s purchased in the 30s by Brazilian police forces. The name is usually used to refer to two distinctive modifications from the 70s, attempting to make the 900rpm machine pistol a little more controllable. 295 PASAMs are just regular M712s, but 101 "Modification One" guns were modified with an extension welded to the magazine housing which mounted a metal foregrip, and 89 "Modification Two" guns received a more comprehensive upgrade with a foregrip with wooden grip panels and a lengthened rear grip with a 12.6 in (32 cm) fixed tubular stock permanently attached to it. Oddly, Brazil only ever purchased 10-round magazines for these weapons. 2 Mauser C96 "Red 9"
Six shot Mauser C96 Broomhandle - 7.63x25mm Mauser. Note the "cone" style hammer, also seen on early examples of the standard ten shot model, and the early-style safety with no hole through the knob. 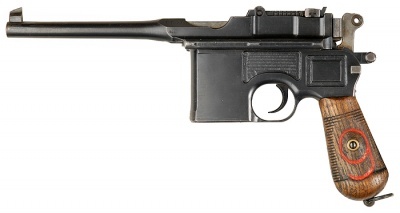 Mauser C96 M1930 - 7.63x25mm Mauser. Note the stepped barrel. Marcel Gassouk "The Limping" Fitted with a stock. Fabio Testi Tonino Russo C99 "Regia Marina"
Avgust Baltrusaitis Timokha "The Earring"
Viktor Terekhov A Chekist M1920 "Rework"
Deadliest Warrior Nazi Waffen SS Leader 2009-??? Elementary Masked Home Invader "One Way to Get Off" (Episode 1.07) 2012-???? Penny Dreadful Timothy Dalton Malcolm Murray The C96 is described as a 'prototype', yet the first prototype of the C96 was not built until 1895, and was certainly not sold to the public. However, a genuine early 'conehammer' pistol is used for the prop, and is accurately depicted in use. 2014-??? 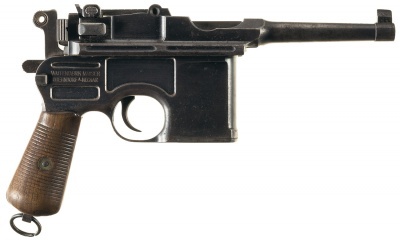 Mauser C96 "Red 9" Version for the German Army - 9x19mm. This model is World War I dated. Extremely Rare Mauser C96 M1902 Hammer Safety, 6-Shot, Checkered Grips. An early example of what later will be called the "Bolo" style Broomhandle. Mauser M1917 Trench Carbine with 40-round magazine - 9x19mm Parabellum. This is a later variant; the first carbines had a slightly different receiver, which also allowed for the use of short 10-shot magazines, which became impossible on later M1917s (but 20 and 40-round magazines were interchangeable). 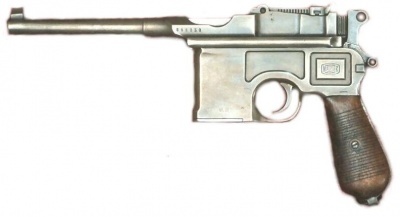 Mauser - A list of all firearms manufactured by Mauser.